Imaverol is a synthetic, antifungal drug suitable for horses, cattle and dogs. Diluted in water and applied as a gentle wash, it is highly effective against the main types of Dermatophytes which cause ringworm. Laboratory studies in rodents have not produced evidence of embryotoxic or teratogenic effects. This product may be given to pregnant and lactating animals. The concentrated Imaverol solution should be diluted by adding 1 part to 50 parts warm water to provide a 2 mg/ml emulsion. Dermatophytes will extend into the hair follicles. Possible crusts must therefore be removed with a hard brush which has been soaked in the diluted Imaverol emulsion. It is highly recommended that the animal is sprayed entirely at the first treatment so as to reach the subclinical lesions as well. Cattle: depending on the nature of the lesions, cattle should be treated 3 to 4 times at 3-day intervals. The animals should either be washed with the diluted emulsion or the emulsion should be applied to them with a sprayer or high-pressure cleaning unit. Horses: the lesions and surrounding skin should be washed with the diluted emulsion 4 times at 3-day intervals. Dogs: the animals should be washed with the diluted emulsion 4 times at 3-day intervals. While doing this, one should rub thoroughly in the direction opposite to the hair growth to make sure that the skin is thoroughly wet. For the same reason, it is recommended that long haired dogs be clipped before treatment. Enilconazole as a 2 mg/ml emulsion is well tolerated. Supportive treatment as required. Cattle: Meat - Zero daysCattle: Milk - zero hours. Horse: Meat - Zero days. Pharmacotherapeutic group: Antifungals for topical use – imidazole and triazole derivatives. Enilconazole is a synthetic broad-spectrum antimycotic with a high activity against most of the common dermatophytes and various other fungi and yeasts. It is a selective inhibitor of ergosterol biosynthesis, an essential component of the cell membrane of fungi and yeasts. This results in irreversible changes which are the origin of the fungicidal effect. The systemic availability after topical administration of enilconazole in animals is very low. An extensive first-pass metabolism has been demonstrated after oral administration. Tissue residues are almost non-existent and, relatively, are highest in the liver. Depletion from tissues and plasma occurs with a half-life of about 12 to 16 hours in cattle. Enilconazole is extensively metabolised and the main excretion routes are urine and faeces. Excretion in the milk from cattle is very limited. Shelf life after dilution according to directions: 6 weeks. Container: amber Type III glass bottle containing 100 ml of concentrate. Container: white, high density polyethylene bottle with transparent window containing 1 litre of concentrate. Do not allow the product to contaminate streams or water supplies. Below are some recent questions we've received regarding Imaverol Ringworm Treatment, including answers from our team. Is it ok if your dog licks at the ringworm after treatment has been applied (would try to prevent until dried, obviously) or would a "lampshade" be required? It is unlikely to do your dog any harm if they do lick the ringworm lesions after treatment. However licking is likely to delay healing and could cause a secondary infection so it would be much better to prevent it. Can this product be used on a donkey ? Yes this product is safe to use on donkeys. However it is not licensed for donkeys so you will need a prescription to purchase it for a donkey. No, Imaverol is intended for use on the horse. An anti-fungal disinfectant such as Aqueos Equine Disinfectant is the best thing to treat rugs, brushes, stable etc. My horse has two small ringworm patches on his muzzle. He is a cob with a very thick winter coat. It is too cold to bath him at the moment. Should he sprayed all over with the product, or will it be sufficient to treat the affected area only? Not sure if he was sprayed that the product would reach his skin through winter coat. It is often effective to treat just the visible lesions alone. Ideally you should spray the entire animal at the start of treatment, then treat just the obvious, affected bits 4 times at 3 day intervals. If the coat is wet or muddy before you start then that will not help. The winter coat does not help either, though it still might work perfectly well enough. I would try to treat the obvious bits carefully and see how it goes from there. Chances are that will work perfectly well in fact. Can this product be used with Frontline? How long should I wait between applying the Frontline and applying the Imaverol? Frontline and Imaverol can be used together but routine bathing will reduce the duration of protection against fleas and ticks. If this is a one-off Imaverol treatment, I would recommend completing the Imaverol bathing period before applying Frontline. Dogs should be bathed with the diluted Imaverol 4 times, with 3 day intervals. After the final treatment, you can then apply Frontline. If you need to use Imaverol more frequently, you will need to wait 2 days after Frontline application before you can bath your dog. Studies haven't been carried out to see how much frequent bathing reduces duration of protection, so I'd recommend keeping an eye on your dog and if he has a problem with fleas, ask your vet to advise you on applying Frontline more frequently. Is it a preventative measure or a cure? Just to clarify, is this a cure for ring worm or a prevention?? This is intended to be a cure and is usually very effective when used as directed. Nothing in medicine is ever 100% certain, but it is not used as a preventative. How much will the 100ml bottle treat ? Would this be enough for the 4 wash treatment. It depends what you are treating. You have to dilute the Imaverol by adding 1ml to 50mls of water. You then use that liquid to thoroughly we all the skin. For a small animal there is plenty to do 4 washes. If you are treating a large horse, you might have difficulty. Quarter of the bottle will make up 1.25 litres of liquid to treat your animal. If you can wet the entire surface with that, then you are fine. Imaverol is used for small animals such as Guinea Pigs up to horses and cattle. Use for fungal not ringworm? Hi again. Can imaverol be used for other fungal infections that are not ringworm? The active ingredient is effective against many types of fungal organism. However using it for other infections may or may not work, or be safe, so you should ask your own vet about this. Can this be used for guinea pigs? Is it licensed for them? I have read lots about this being used for guinea pigs but read the question and answer about cats where it was said it isn't licensed for cats. Is it licensed for guinea pigs? I know itrafungol can be prescribed for guinea pigs. 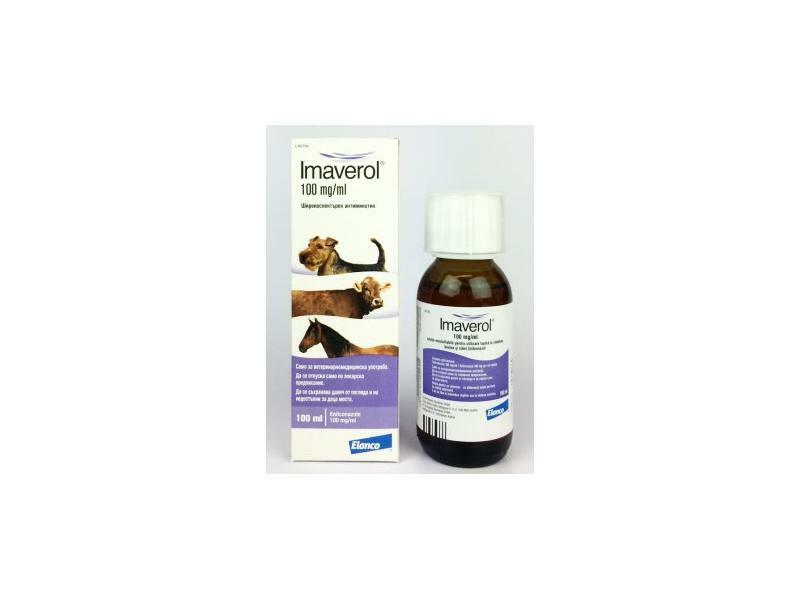 Imaverol is a POM-VPS product for dogs, cattle and horses and isn't licensed for cats or guinea pigs but it is often prescribed for them by their veterinary surgeon. We wouldn't be allowed to supply you without a prescription from your vet if you wanted to use it on an animal it isn't licensed for, because this is known as 'off-label' use. Your vet will be able to write you an 'off-label' prescription for them which will include a dosage appropriate for the animal, and then we would be allowed to supply under their recommendation. This product should not be rinsed off; it is left to dry on the coat. (Make sure your dog does not get cold while this happens).